I'm kind of on a flower kick this week. I guess it's this beautiful summer weather. I'm also on a white ironstone kick, so I thought I would see what I could find that combines the two. I love that this look can be used for any decor type. Lush pink roses are perfect for a cottage home while wild flowers are a wonderful touch for a farmhouse look . What a wonderful idea for a wedding, to be kept and used in the newlyweds home. Now I'm going to want to hunt even harder for some more white ironstone. 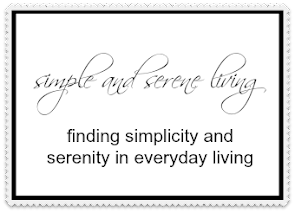 Hope you all have a most lovely day. Oh, I love the little short round bowl with the other bowl inside it. 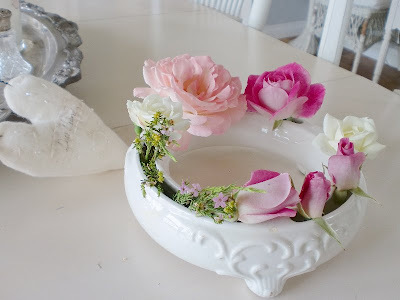 The fresh flowers decorating the edge make it look like a little Pool of Refreshing! I love the shape of pitchers. The picture with the three pitchers is my favorite! I love little bouquets of simple flowers here and there. Just did a post a few minutes ago using flowers getting ready for a party. Hi Laura! 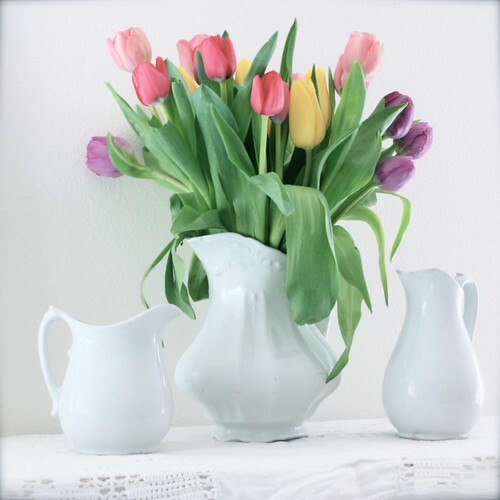 I LOVE white ironstone and have managed to find some lovely pieces at our area thrift stores. Welcome as my newest blog follower! Hi, I am a new follower. I love the pics! 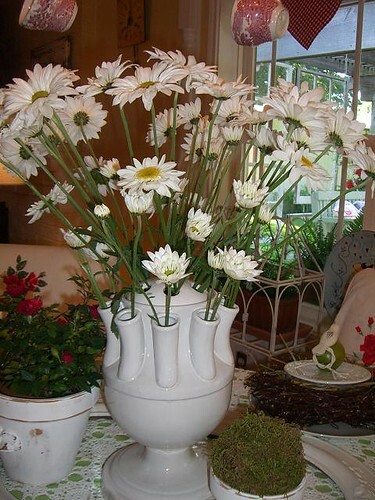 Is there anything more gorgeous then flowers and white ironstone! Thanks so much for visiting, I'm your newest follower also and will be visiting often! I see that you are in Lexington, my best friend moved there a year ago, she's a prof at the collage near there, (can't remember the name) I've been up to visit. It's so beautiful there, I love Ky. We try to get together every 3 mos or so either there or here. this all lends a very shabby chic vibe, which i absolutely LOVE!